North Korea vows nuclear strike against U.S.
SEOUL, South Korea North Korea on Thursday vowed to launch a pre-emptive nuclear strike against the United States, amplifying its threatening rhetoric hours ahead of a scheduled vote by U.N. diplomats on whether to level new sanctions against Pyongyang for its recent nuclear test. Although North Korea boasts of nuclear bombs and preemptive strikes, it is not thought to have mastered the ability to produce a warhead small enough to put on a missile capable of reaching the U.S. It is believed to have enough nuclear fuel, however, for several crude nuclear devices. Such inflammatory rhetoric is common from North Korea, and especially so in recent days. North Korea is angry over the possible sanctions and over upcoming U.S.-South Korean military drills. At a mass rally in Pyongyang on Thursday, tens of thousands of North Koreans protested the U.S.-South Korean war drills and sanctions. All 15 of the U.N. Security Council's members voted to impose a fourth round of sanctions against Pyongyang in a fresh attempt to rein in its nuclear and ballistic missile programs. The statement by the North Korean Foreign Ministry spokesman was carried by the North's official Korean Central News Agency. 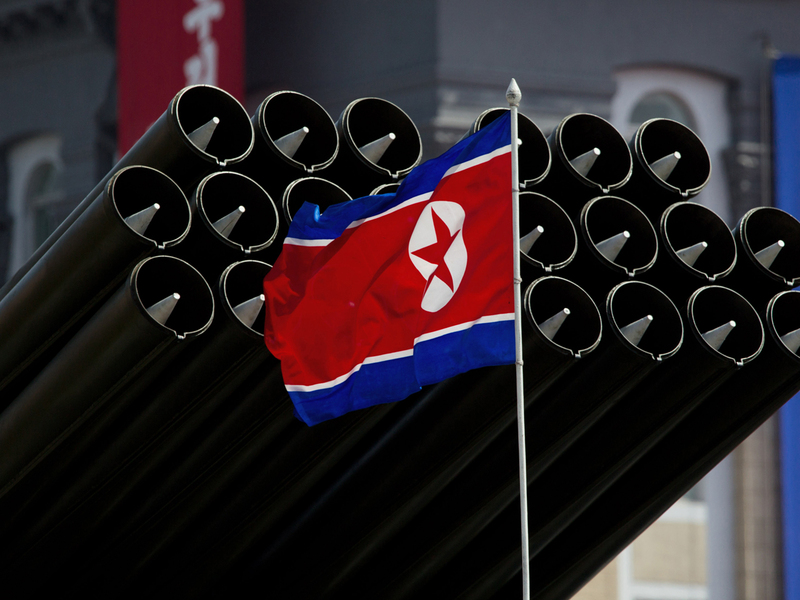 It accused the U.S. of leading efforts to slap sanctions on North Korea. The statement said the new sanctions would only advance the timing for North Korea to fulfill previous vows to take "powerful second and third countermeasures" against its enemies. It hasn't elaborated on those measures. The statement said North Korea "strongly warns the U.N. Security Council not to make another big blunder like the one in the past when it earned the inveterate grudge of the Korean nation by acting as a war servant for the U.S. in 1950." North Korea demanded the U.N. Security Council immediately dismantle the American-led U.N. Command that's based in Seoul and move to end the state of war that exists on the Korean Peninsula, which continues six decades after fighting stopped because an armistice, not a peace treaty, ended the war. In anticipation of the resolution's adoption, North Korea earlier in the week threatened to cancel the 1953 cease-fire that ended the Korean War. U.S. U.N. Ambassador Susan Rice said the resolution as proposed would impose some of the strongest sanctions ever ordered by the United Nations. The final version of the draft resolution, released Wednesday, identified three individuals, one corporation and one organization that would be added to the U.N. sanctions list if the measure is approved. The targets include top officials at a company that is the country's primary arms dealer and main exporter of ballistic missile-related equipment, and a national organization responsible for research and development of missiles and probably nuclear weapons. The success of a new round of sanctions could depend on enforcement by China, where most of the companies and banks that North Korea is believed to work with are based. The draft resolution condemns the latest nuclear test "in the strongest terms" for violating and flagrantly disregarding council resolutions, bans further ballistic missile launches, nuclear tests "or any other provocation," and demands that North Korea return to the Nuclear Nonproliferation Treaty. It also condemns all of North Korea's ongoing nuclear activities, including its uranium enrichment. But the proposed resolution stresses the council's commitment "to a peaceful, diplomatic and political solution" and urged a resumption of six-party talks with the aim of denuclearizing the Korean Peninsula "in a peaceful manner." The proposed resolution would make it significantly harder for North Korea to move around the funds it needs to carry out its illicit programs and strengthen existing sanctions and the inspection of suspect cargo bound to and from the country. It would also ban countries from exporting specific luxury goods to the North, including yachts, luxury automobiles, racing cars, and jewelry with semi-precious and precious stones and precious metals. According to the draft, all countries would now be required to freeze financial transactions or services that could contribute to North Korea's nuclear or missile programs. To get around financial sanctions, North Koreans have been carrying around large suitcases filled with cash to move illicit funds. The draft resolution expresses concern that these bulk cash transfers may be used to evade sanctions. It clarifies that the freeze on financial transactions and services that could violate sanctions applies to all cash transfers as well as the cash couriers. The proposed resolution also bans all countries from providing public financial support for trade deals, such as granting export credits, guarantees or insurance, if the assistance could contribute to the North's nuclear or missile programs. It includes what a senior diplomat called unprecedented new travel sanctions that would require countries to expel agents working for sanctioned North Korean companies. The draft also requires states to inspect suspect cargo on their territory and prevent any vessel that refuses an inspection from entering their ports. And a new aviation measure calls on states to deny aircraft permission to take off, land or fly over their territory if illicit cargo is suspected to be aboard.